Children often do not put on weight when they have Frequent Colds. Also, some kids have Frequent Colds since they have low body weight. In both the cases, homeopathy helps to increase weight and reduce colds. Frequent Colds due to allergy, infection, pollen or pollution; homeopathy is the best treatment. It almost always works. Homeopathic medicines are popular and effective for Frequent Colds. 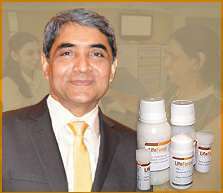 Dr. Rajesh Shah’s research based molecules have been found to be even more effective. Besides some of the following ingredients, the product contains Dr Shah's international Patented, Research-based, highly effective medicines. Every case calls for a detailed study of the patient individually. The exact treatment formula is determined only on "in-depth" evaluation of the individual case. The medicines described below are some of the commonly used medicines for Frequent colds. This is only for information. The readers are advised not to indulge in any kind of self-medication. It is one of the commonly used homeopathic drugs which has got profound action on every organ and tissue of the body. It is prepared from arsenic trioxide which undergoes the process of potentization to bring its latent curative powers to the surface. It is a wonderful remedy and has a very wide sphere of action. It predominantly acts on the gastrointestinal tract, respiratory system, urinary system, skin, reproductive system, nervous system, etc. It works for the cases of colds which are either allergic in nature or those which have a secondary infection. Arsenic alb. is frequently prescribed for conditions like frequent colds, GERD, asthmatic bronchitis, sinusitis, fevers, psoriasis, eczema, gastritis, enteritis, food poisoning, etc. It is indicated for watery, thin, excoriating discharges. Nose feels completely stopped. Sneezes without relief. Frequent colds worse in the open air; better indoors. Burning and bleeding in the nostrils. A frequent cough made worse by lying down. A cough worse after midnight. The patient craves for cold water and drinks small quantities at a time. Most of the complaints in such patients are associated with intense weakness and debility, restlessness and lot of anxiety. Pulsatilla is effective in all sorts of inflammatory conditions of the upper and lower respiratory tract, gastrointestinal tract, reproductive system, veins, skin, eyes, urinary tract, etc. It is one of the frequently used medicines for complaints of frequent colds, irritable bowel syndrome, recurrent styes and chalazion, asthma, urticaria, lichen planus, vitiligo, trigeminal neuralgia, etc. It is one of the best remedies for gynecological and pregnancy-related complaints. Thick, bland, yellowish discharges. Colds with loss of smell. Right nostril stopped up. Nose blocked in the evenings. Yellow discharges. Better in the open air and with head held high. This remedy is prepared from potassium dichromate. People needing this remedy are fleshy, fat, light complexioned people who have an inherent tendency to suffer from frequent colds. Conditions of the respiratory and gastrointestinal systems, bones and fibrous tissues are all well addressed by this remedy. This medicine acts well in frequent colds in fat, flabby children. In colds, the nasal discharges appear thick, ropy, though, elastic and greenish-yellow. Loss of smell, a lot of difficulty in breathing and violent sneezing accompany these attacks of frequent colds. All symptoms are generally worse in the morning. This homeopathic remedy is chemically known as potassium chloride. Sub-acute inflammatory states with glandular swellings are excellently treated with this homeopathic remedy. In conditions like frequent colds, there is a gray or white coating at the base of the tongue. The nose is very stuffy and nasal discharge appears thick and white. Children who are prone to threadworm and other intestinal infections and whose tummies get upset on having rich/fatty foods do well on receiving Kali. Mur. Euphrasia is an excellent homeopathic preparation made from eye bright. The colds affect the mucous membranes of both the eyes and nose. The nasal discharges are profuse, fluent and in some accompanied by a violent cough with abundant expectoration, all worse in the night. The face appears red, and the cheeks are warm with the frequent attacks of colds. The remedy acts on the skin, mucous membranes, blood, gastrointestinal tract, kidneys, brain. It has a tendency to produce benign growths, spongy tumors, warts, condylomata. Has specific antibacterial action in gonorrhea. Patient, in general, feels better in dry weather and worse in damp, humid atmosphere. Patient has many fixed ideas; music causes weeping and trembling. Emotional sensitiveness. The skin looks unhealthy in general. Thuja is a great remedy for recurrent nasal polyps that cause frequent sinusitis and colds. More commonly the polyps are seen in the right side. Frequent colds in Thuja are accompanied by thick, green mucus; blood and pus. The nose feels dry and there is the sensation of a painful pressure at the root of the nose. On blowing the nose, there is pain felt in the teeth. This wonderful drug in homeopathy is prepared from the substance of a tubercular abscess. It must be borne in mind that the remedy does not contain any part of the original drug substance in its material form but it contains only the dynamic powers of the drug which are brought forth by the process of potentization. Tuberculinum is an excellent remedy for people very sensitive mentally and physically. People appearing very tired always, who have an aversion to work, and constantly wanting changes are likely to respond well to Tuberculinum. When many other well-selected remedies fail to give relief, Tuberculinum is a reliable choice. The skin, respiratory, gastrointestinal, nervous and reproductive systems are all well acted upon by this remedy. It's frequently prescribed in cases of colds, asthmatic bronchitis, pneumonia, chronic sinusitis, lymphadenitis, chronic eczema, renal affections, chronic cystitis, arthritis, epilepsy, etc. People needing Tuberculinum take on colds from the slightest exposure. Any changes in the weather can result in a cold. Colds with hard dry hacking cough enlarged tonsils and with thick, easy, profuse expectoration are indications for Tuberculinum. This homeopathic remedy is a preparation of the iodide of lime. People or children who are flabby and have an inherent tendency to catch colds as well as suffer from enlarged tonsils and glands in the neck respond well to Calc. iod. The secretions are profuse and yellow. There is a sensation of lightheadedness and the enlarged tonsils are dotted with many whitish crypts. A stuffy nose with follicular tonsillitis responds well to calc.iod. This is a drug prepared from calcium sulphide and is a good remedy for acute as well as frequent colds. It positively influences the respiratory tract, throat, nerves, skin, glands, bones, etc. Patient requiring Hepar sulph is usually very sensitive to cold in any form such as cold food or drinks or even cold draft of air. Immediately on exposure to cold in any form, the respiratory system and throat are affected. Nearly every exposure to dry, cold wind leaves him sneezing and a runny nose. The discharge later becomes thick and offensive. Nose feels stopped up with a smell like old cheese every time he goes out into the cold air. The patient complains of pain in the throat as if some splinter or plug is stuck in the throat. Difficulty in swallowing is marked. With colds, there is an aversion to fatty foods and frequent eructation without smell or taste. It is one of the splendid acts of homeopathy that substances labeled as inert can also be used effectively to treat a large variety of disorders. Silica is the example of one such substance, which is chemically inert in its natural form, but after undergoing the process of potentization it gets transformed into a wonderful, deep acting remedy. Silica is in true sense called as polychrest remedy as it has a broad spectrum of action, useful for a wide range of disease processes. In fact, this remedy has helped Homoeopaths world over to treat so-called surgical conditions gently without requiring a knife. Silica positively influences bones and joints, mucous membranes, skin, cellular tissue, nerves, glands, lungs, digestive system, etc. Silica is one of the frequently used medicines for complaints of frequent colds, IBS, fissure, vitiligo, eczema, lichen planus, herpes, urticaria, asthmatic bronchitis, pneumonia, tuberculosis, styes and chalazion, trigeminal neuralgia, complaints of nails, tonsillitis, etc. Frequent colds in refined, delicate and yielding individuals. The common trait is that the person has low self-confidence. The Silica child often suffers repeated infections, such as colds, ear infections, or pharyngitis. Often the stamina is very poor. The features are fine and delicate, the hair is often quite thin, the skin is pale, and the head may be overly large. There is low stamina which makes the child, as well as the adult, suffer from frequent infections like colds and throat infections. Even the bones, nails and teeth seem unhealthy in person's requiring this remedy. Person's needing Silicea suffers from frequent colds and flu. Their nose seems dry but still stuffed up. They may have nasal polyps which predispose them to recurrent sinusitis as well as frequent colds. This is a wonderful remedy prepared by the potentization of inorganic phosphorus. After undergoing the process of potentization, the latent healing powers of this drug are brought to surface and it proves to be a wonderful remedy capable of curing a wide range of diseases. Phosphorus predominantly acts on the respiratory system, gastrointestinal tract, hepatobiliary system, blood, kidneys, bones, lungs, nervous tissue, etc. Oversensitive to external impressions such as light, sound, odors, touch, thunderstorms, etc. Restless, excitable and nervous individuals. There is increased susceptibility to colds amongst children. Oversensitive to smells. Irritation of the mucous membranes causing nosebleeds. The cold is worse in the cold air though he feels thirsty for cold water. Cold, runny nose with a cough due to tickling in larynx. A cough worse talking, lying down, lying on left side, laughing and reading.